Mumbai: N. Chandrasekaran, 54, completed a year in his role as chairman of Tata Sons Ltd on 21 February, capping a period in which he stabilized the group after the messy ouster of former chairman Cyrus Mistry. Chandrasekaran, unlike his illustrious predecessor Ratan Tata, prefers to maintain a low profile. Tata was a rock star in comparison, something amply in evidence every time he visited the Delhi Auto Expo. By contrast, Chandra’s visit to the Delhi Auto Expo went largely unnoticed. Chandrasekaran wouldn’t mind that. He went on a recce of the Tata products on display—enquired about the designs, the electric vehicles on display, and interacted with employees, dealers, financers and other stakeholders of the company. “Tata Motors has had an incredible year so far, making a huge turnaround. The company is focused on innovation and committed to the future of mobility in every sense of the word," he told them. The encouragement came days after Tata Motors Ltd posted its biggest jump in net profit in seven quarters to Rs1,214.6 crore during the quarter ended 31 December as against a paltry profit of Rs111.57 crore in the year ago period. This happened when Chandrasekaran had made up his mind to pull the plug on the domestic passenger car business, but later decided to stay invested in the segment, considering the growth that the Indian auto industry offers. “Tata Motors’ performance is sustainable and it is going to get better from here," he later told Mint. Tata Motors isn’t the only company in the group that has shown a marked improvement in results during the past one year under his leadership. Tata Steel Ltd’s net profit increased fivefold for the quarter ended 31 December. Earnings of Tata Consultancy Services Ltd (TCS) rose 1% to Rs6,531 crore. In fact, TCS has been pulling ahead of its peers in terms of market capitalization. At Tata Chemicals Ltd, they rose 152% to Rs770 crore. At Indian Hotels Co. Ltd, net profit was flat. In doing so, the group seems to have left behind the ongoing legal tussle on several fronts between group holding company Tata Sons Ltd and Cyrus Mistry. “He has stuck to core businesses and pulled the rug from underneath businesses such as telecom, fertilizer and curtailing finance foray after the rebuke on the banking licence. The rebuke actually predates Chandra, but he overhauled the finance activities," said a top stock broker requesting anonymity. Chandrasekaran inherited a set of companies in his group’s portfolio that had been bleeding for a while (including Tata Motors’ domestic business, which also threw up a surprise net profit in the December quarter), an unstable leadership team after the ouster of Cyrus Mistry, legal dispute involving NTT Docomo—the beleaguered telecom business—the troubled operations of Tata Steel in Europe, the never-ending debate over the future of Nano and, most importantly, the challenge of restoring group morale that was down, according to people who spoke with Mint for the story. “These were the problem areas and he devoted his time to that. He said that companies must look at profitability, and that he has managed to establish," said a top group executive requesting anonymity. In this period, Chandrasekaran finalized the resolution of a $1.2 billion legal dispute with DoCoMo, which cleared the way for the group’s exit from the loss-making mobile business that was sold to Bharti Airtel Ltd in October. He also decided to merge Tata Steel’s European business with ThyssenKrupp. “I needed to stop the bleeding in major areas," Chandrasekaran told the Financial Times in an interview that appeared on 19 February. “Many of our companies had high leverage, and I wanted to fix the leverage," he told FT. Repeated requests for an interview with Mint were declined. A detailed questionnaire sent to Tata Sons’ spokesperson remained unanswered till press time. “Investors are mostly happy, looking at how some of the companies have performed in the markets. Tata Steel and TCS have done well. Tata Global Beverages Ltd, Indian Hotels have done relatively better. They are beating peers," said Mahantesh Sabarad, head of retail research at Mumbai-based SBI Cap Securities Ltd.
Chandrasekaran has also been helped by the turnaround of the economy amid a growing anti-globalization trend around the world that has forced the US and many countries in Europe to turn inwards. Most Tata group firms are globally integrated, but the growing protectionism in overseas markets is mitigated by the domestic market. “Look at any of the growing company of the group, most of them are doing well because their India business is doing good. Future for the world is going to be India and that will be for the group," Sabarad of SBI Cap said. Chandrasekaran has a keen eye on India, said the group executive cited above in the story. “(But) you cannot play by the fact that I am an Indian company. Market has become very competitive. There is a liberalized financial regime. If anybody wants to invest, there are more avenues to raise that investment than it was ever was. It creates a level-playing field. Tata will have to see that it will succeed in that environment," said the group executive who refused to be named. So, what are the pain points? The operating structure between Tata Sons, Tata Trusts and the rest of the companies are not clearly defined for investors to understand who is driving the strategy. “Today, I am unclear whether MD (managing director) of Tata Steel decides or Tata Sons board decides about placing bids for Bhushan Steel," said Shriram Subramanian, managing director of InGovern—a proxy advisory firm. According to the current group structure, Tata Sons has control over its subsidiaries at varied levels. It controls about 74% in TCS and just about 21% in Titan. In Tata Sons itself, the Tata Trusts own a 66% stake and about 18% is owned by the Mistry family, which Tatas may want to buy out eventually. More so, the Tata group is a diversified business conglomerate with more than 20 listed companies and about 100 operating firms. That may put a lot of weight behind the Tata brand name but it does make the organization ponderous and difficult to manoeuvre. Chandrasekaran has spoken about simplifying the group structure in order to make it more agile and aggressive, and he is “doing his bit" to unlock the investor potential for the group. For example, in the past year alone, he has spent Rs10,000 crore in unwinding of cross holdings, said a second executive from the group. This includes purchase of Tata Steel’s 1.6% stake in Tata Motors, Tata Beverages’ 4.5% stake in Tata Chemicals, Tata Chemicals’ 6.9% stake in Tata Beverages and purchase of Tata Power’s stake in Tata Communications. The Tata group is looking to drastically prune the number of firms in its portfolio and take tough calls on non-performing, debt-laden firms and bring greater financial discipline. The plan that involves rationalization of the portfolio from the current 110 to a maximum of up to five, six or seven will help the 150-year-old conglomerate that boasts an expansive presence, from steel and automobiles to technology and infrastructure. “There seems to be more energy. (But) for investors, the data points are not yet at substantive levels to back that," Subramanian of InGovern said. According to Sabarad of SBI Cap, the group is over-leveraged. About Rs2.41 trillion debt in total with companies such as Tata Power, Tata Steel and Indian Hotels having maximum exposure to debt. In the interview to FT, Chandrasekaran outlined the challenge to tackle over-leveraging his top priority. How he deals with underperformers is critical apart from capital allocation, especially in the airlines business, which has a long gestation period and also carries Ratan Tata’s blessings. Raising money to fund Tata’s defence and financial services business will be crucial as they are just opening up. A welcome change, according to a former group employee, is the way Chandrasekaran has resorted to trim top-heavy managements. “Even his own group office has no heavyweights, like it was in RNT (Ratan Naval Tata) days," the person added. When Ratan Tata took over in 1992, he began his group office and brought on board Ishaat Hussain, Kishor Chaukar and R. Gopalakrishnan among others. Those were the days when powerful satraps ran different companies in the group. “He created a very heavyweight group executive office. Some of them came from very heavyweight organizations. Chandra has got some people, but many of them are not heavyweights," the person said. Chandrasekaran has hired Saurabh Agrawal, a former investment banker, as his group chief financial officer; Aarthi Subramanian as group chief digital officer; Banmali Agrawala as head of infrastructure cluster; Shuva Mandal as group’s general counsel and Roopa Purushothaman as its chief economist. 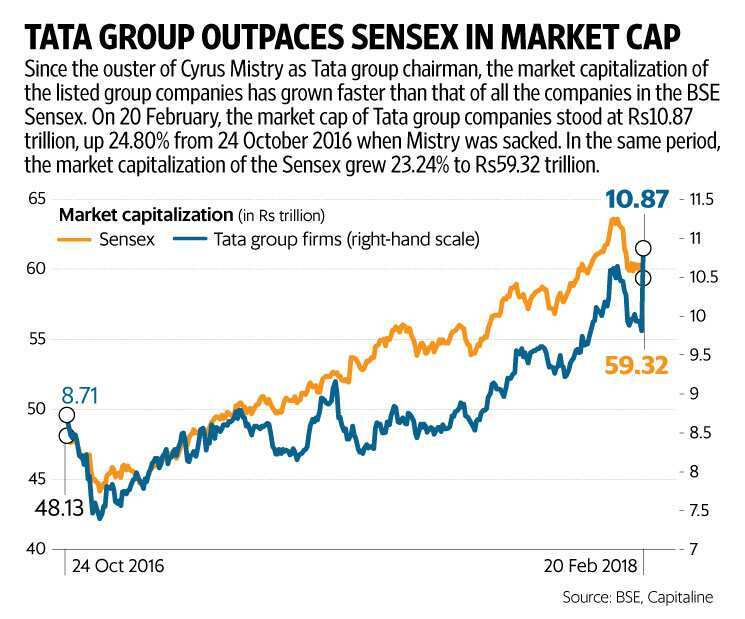 When Ratan Tata hired Cyrus Mistry, he famously told his colleagues that he managed to build a $100 billion group during his tenure and expects it to grow five times in Mistry’s reign. For Chandrasekaran, there are no such expectations. He has the freedom to build on his successes of year one and create a new architecture for the group.